Parkinson’s UK is the charity that helps people with Parkinson’s, their families & also helps to fund research projects to help find a cure for the disease. They are keen to recruit more volunteer committee members to help them run the branch activities which include; charity fundraising, social evenings and support meetings.They are ideally looking for socially motivated people who can give a few hours a month to help us. Offer information, friendship and support to local people with Parkinson’s, their families and carers. Organise regular events and social activities. Join them – and meet other people affected by Parkinson’s in your area. Contact Wales office on 0844 225 3784 or wales@parkinsons.org.uk for details. This article is re-posted with permission from Cardiff Community Couch. The original version was posted on 15th November 2013 and can be found here. Homeless Link estimates rough sleeping has gone up by more than a third across the UK over the past two years. The rise is less pronounced in Wales, but reports of rough sleepers have been on the rise. Huggard provides a combination of shelter and skills to Cardiff’s homeless to help them regain their independence. The day centre is run largely by volunteers, as one might expect. But what really struck me as I chatted with them was that a vast proportion of them are homeless themselves. Here are people who are more than willing to work, but many have faced barriers into attaining basics like a house, a job and an income. Providing homeless people with the skills they need to work towards getting these things is at the heart of Huggard’s ethos. The strikingly modern and clean day centre has a pleasant, friendly vibe. I’m used to people shrinking back in apprehension as soon as I say I’m a journalist. Here volunteers, homeless and otherwise, flock to tell me about how much they’ve benefited from the centre. By working in the kitchen, they learn how to cook for themselves as well as all the time-management and customer service skills that come with working in catering. They’re given the opportunity to pass food hygiene qualifications that are sought after in workplaces. I’m also told that people with mental health problems find it therapeutic to tend the garden and look after the chickens kept there. As well as giving the homeless opportunities to help themselves, Huggard collects donations of food, clothes and furniture. There are emergency cubicles for people to sleep in if the only alternative is sleeping rough. Once they’ve managed to secure their own accommodation, they can take the furniture donations to furnish their new home. I could go on singing Huggard’s praises, but you can hear all the best bits from the volunteers themselves. This article is re-posted with permission from Cardiff Community Couch. The original version was posted on 9th November 2013 and can be found here. It was a bleak week for Wales in employment news when the Welsh Affairs Committee announced only one in nine people had found long-term employment through the government’s work schemes. The Jobs Growth Wales scheme, separate from the UK government’s Work Programme, was aimed at young people aged between 16-24. It would appear Welsh Government has recognised that youth unemployment urgently needs addressing. If you think it’s difficult for a graduate with a 2:1 or above to find work, imagine what it must be like for people with hardly any formal education. Many of those people will have come from poor backgrounds, have experienced abusive relationships and have poor health. Those are the kinds of people who end up committing crimes at a young age. Figures from the Youth Justice Board show there were 3725 young offenders between 15-17 in Wales in 2010-11. Statistics from the board also showed 60-80% of young people were likely to reoffend within 12 months. Perhaps most pertinent of all, the Ministry of Justice says 74% of ex-offenders having housing and employment problems went back to crime, while a much lower 43% of those not experiencing those problems reoffended. The evidence overwhelmingly suggests supporting ex-offenders rather than writing them off as unsuitable for work is key to reducing crime, raising employment levels and boosting the economy. 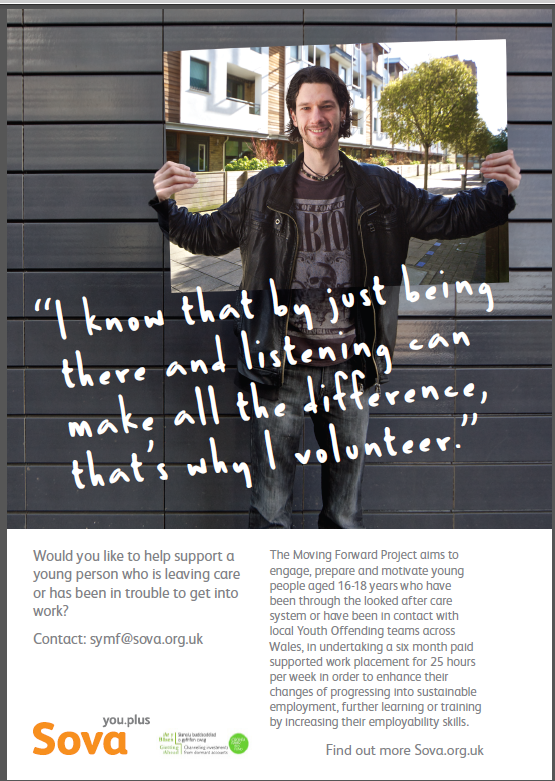 Moving Forward is a project set up by SOVA and other organisations to offer mentoring support to 16-18 year olds who have either left care or have been convicted of criminal offences. Many young people who have been in trouble now want to grow up and get their lives back on track, But there is a lack of services and support to help them rebuild their lives. I caught up with Rhian Phillips, SOVA’s volunteer co-ordinator in South East Wales for Moving Forward, to find out more about how SOVA is going to help and why this service is so desperately needed. This article is re-posted with permission from Cardiff Community Couch. The original version can be found here. It was never a secret that a huge proportion of supermarket food goes to waste. But when Tesco published its waste figures for the first time last week, it really put the problem into perspective. The study, carried out in conjunction with the Waste and Resources Action Programme (WRAP), revealed 28,500 tonnes of food were wasted in Tesco’s stores and distribution centres in the first six months of 2013. Tesco stores and its customers threw away two thirds of its bagged salads, almost half its baked goods and 40% of its apples. Of course this is bad news for the company, but what is the extent of the impact on everyone else? Tesco’s research also revealed that food waste costs families in the UK about £700 a year. Tesco has pledged to make changes to its policies, and has also recently announced it will be increasing its partnership with food charity FareShare. The corporation will donate about seven million meals worth of its fresh food a year to the charity, providing much-needed resources to services that have increasingly been put under pressure since the advent of the recession. There are already many organisations who work tirelessly to help people who can’t afford to feed themselves. Cardiff Foodbank is just one of many food charities in Wales, but it’s also one of the most popular. I visited one of the food bank’s Woodville collection point on Crwys Road last weekend to find out just how much the local community relies on its services. So far this financial year, about 1,200 people will have received almost ten tons of food via Woodville Christian Centre. Cardiff Foodbank’s Project Manager Ian Purcell tells me it is one of the city’s biggest food collection points. There is a distinct atmosphere of warmth as I walk into the centre. Volunteers, who proudly wear their green polo shirts, emblazoned with the charity’s logo, offer me a warm welcome and a cup of tea. I’m waiting to speak to Saturday’s team leader, Bruce Hurrell, who is chatting cheerfully with those who have come to receive food packages today. Two men bundled up in heavy coats are having an animated discussion, despite their weary appearances, over steaming mugs of tea and a plate of biscuits. A timid-looking young couple are next to come through the door with their child in a pushchair, who looks about four or five years old. Their smiles suggest they are happy and relieved to be getting help from the food bank, although they are not confident enough to talk to me about their reasons for coming here. As volunteer Ann Roberts tells me, it takes courage to present yourself at a food bank as a last resort. I ask her if she’s had any particularly memorable encounters with people who have used the food bank. She tells me she’s been moved to tears on some occasions. The woman from Ann’s anecdote isn’t the only one to want to give something back when easier times come around. Leanne Mackay is just one of the food bank’s many returning users who says she would like to volunteer for the centre once her situation has improved. When I finally get a chance to speak to Bruce, he emphasises that the food bank is primarily for emergency use, not a service people should rely on permanently. Each person or family can only exchange vouchers for food at the bank a total of three times, although he does say they never like to turn people away. As such, there are sometimes exceptions, as more and more people find themselves in long-term financial hardship. He tells me food banks receive very little cash funding. Instead, they rely almost entirely on food donations from the general public and local businesses. Interestingly, he says Cardiff University is the biggest single donor to the food bank in the area. Bruce says the busiest period for food banks is the run-up to Christmas. The severity of the problem truly struck me when Bruce told me people this winter may have to make a choice between warmth and eating. Although most of the visitors to the food bank are individuals and families, other volunteering organisations depend on its services as well. Yasmin Khan is a volunteer at refugee charity Sova, and has come to the food bank today to pick up food for a group of refugees. She says, although food banks provide an excellent service, many refugees and immigrants don’t know where to find them. Raising awareness of how to access these services is vital for people who have lost everything and who are struggling get by in a strange new place, she tells me. 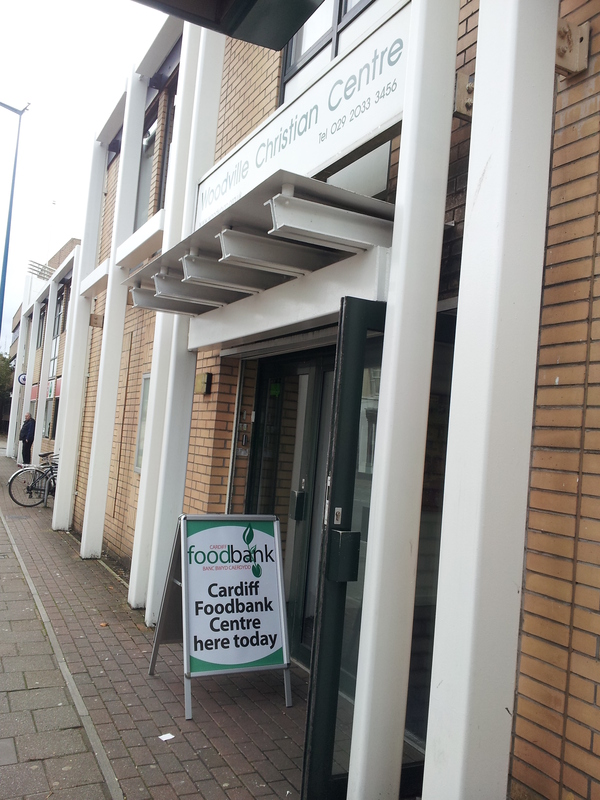 My visit to the food bank collection point has motivated me to apply to volunteer there myself. But I, like many others, am concerned about whether I will be able to juggle volunteering alongside studying a full-time MA. Before I leave, volunteer Gavin Davis tells me he manages to fit in two hours a week working for the food bank even alongside playing in four bands and working two jobs! Food for thought indeed. My name is Shelley Elgin. I work for Alzheimer’s Society as Volunteering Development Manager for Wales. I started with the Society in July 2012. My passion for volunteering started when I was a trainee tutor at my local education centre, where I volunteered by helping the older generation learn computer skills. I also became a member of the school PTA and took part in lots of fundraising activities. Now after 10 years of being a volunteer, volunteer trainer and volunteer coordinator I have my dream job. So what does Alzheimer’s Society do? The Society is the UK’s leading care and research charity for people with dementia and their carers; providing direct support and care for people with dementia and their carers through our national helpline, respite care, day care, carer support groups and other local services. Alzheimer’s Society invests in research into the cause, cure, care and prevention of dementia. We give vital information and help educate people with dementia, carers and healthcare professionals. 1 in 3 people over 65 will develop dementia, there are 800,000 people with dementia in the UK, and that figure is set to rise to 1 million by 2021. It is estimated that there are over 45,000 people with dementia in Wales, only 39 per cent receive a formal diagnosis. My initial thought on joining Alzheimer’s Society was how passionate and committed our volunteers are in helping people affected by dementia. They give up their time and go above and beyond. When I first joined, I took part in the Cardiff Memory Walk with my family and I was so impressed by this event it only strengthened my passion in working with the charity. This extended to my children who all went into their school proudly showing off their Memory Walk medals and talking to other children about dementia – they are dementia champions in the making! Our work on the ground relies on volunteers to provide services and fundraise to over 30,000 people every week. My colleagues who provide our frontline services are really keen to recruit volunteers who will work with them on an ongoing basis so they can provide sustainable support for people with dementia. For example, you could help out in a dementia café for just a few hours each week, or you could volunteer to cheer at one of our runs or Memory Walks, or become an ambassador for the Society. Our volunteers are very important to the Society, and without them we would not be able to achieve everything we want to do for people affected by dementia. We are committed to giving a fully supported volunteering experience, from induction, training, and recognition to paid expenses. Our volunteers can really see a difference they are making, which is personally rewarding.